The single phase bipolar regulator is diagramatically represented in the Fig. 1. With the introduction of induction regulators initially, the primary winding was placed in the slots on the inner periphery of a stationary cylindrical core. The concentrically inside stator core. But this arrangement requires large slip rings to be connected on the low voltage, large current secondary winding. 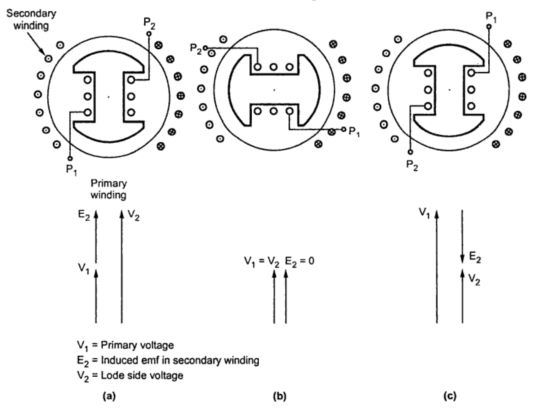 But nowadays, the primary winding is placed on the movable core while the secondary winding on the stationary core as shown in the Fig.1. The primary winding placed on movable member excited by a.c. supply produces alternating flux which induces emf in the secondary (stator). 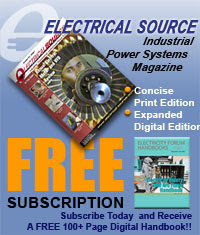 This emf can be varied by changing the relative positions of stator and rotor axes. 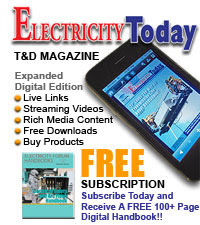 This emf in the secondary is maximum when the axes of two windings coincide. The relative position of stator and rotor axes and emf induced is shown in the Fig.2. From Fig. 2(a), it can be seen that emf induced in secondary is maximum. When the rotor is moved in such a way that the stator and rotor axes are displaced from each other by as shown in the Fig. 2(b), the emf induced in secondary is zero as the mutual inductance between primary and secondary winding reduces to zero. The secondary winding in this case has to carry the load current. When the rotor moved further by 90o, again there is maximum emf E2 in the secondary winding but with a direction so as to reduce the supply voltage as shown in the Fig. 2(c). the current in the primary winding I1 is phasor sum of I2' and Io where Io is no load current which has magnetizing and core loss component respectively . I2 is the load current and its phase angle with respect to load voltage V2 is decided by the load connected on the output side. The single phase regulators are always provided with short circuited tertiary winding, called compensating winding, on an axis in quadrature with the primary winding. In the absence of this compensating winding, the secondary winding wound on the stator would be equivalent to a high resistance choke coil in series with the supply line. The secondary winding under this condition will be like a transformer which has a primary winding but no secondary winding so as to reduce its exciting impedance. The leakage reactance of secondary winding would be large so that for a given line current, a large voltage would be required to overcome the reactance drop and the core would then be saturated. The compensating winding is placed in such a way that its axis is perpendicular to primary, the compensating winding provides maximum mutual inductance with the secondary winding which consequently reduces the effective reactance. The compensating winding will not carry any current when primary and secondary windings are co-axial and displaced by 180o. In intermediate positions from 0 to 180o the mutual inductance between secondary and compensating winding gradually changes from zero to maximum and back to zero again. Due to compensating winding, the variable losses (I2R2 losses) remain constant for a given load current and for various angular positions of rotor. 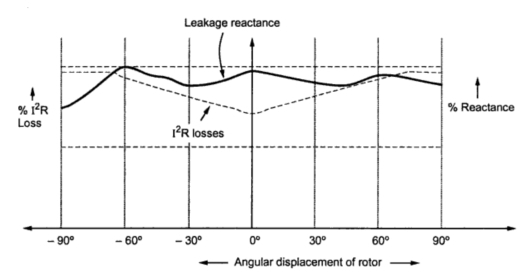 The ampere turns for primary and compensating windings varies with angular displacement of rotor as shown in the Fig. 3(a). The primary and short circuited compensating winding has some effective resistance and I2R2 loss fairly remains constant for variation in rotor angle. This is shown in the Fig. 3(a). The variation of ampere turns of primary, secondary and compensating winding with angular displacement of rotor is shown in the Fig. 3(b). With uniformly distributed windings and sinusoidal flux, the degree of increase or decrease in voltage (boost or buck) is proportional to the sine of the angle of displacement. 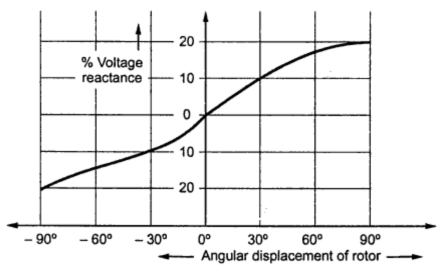 The regulation versus the angular displacement of rotor for a single phase induction regulator is shown in the Fig. 4. The angular displacement of rotor can also be achieved with the help of a small motor geared to the vertical shaft of the rotor of the induction regulator. The motor driving the shaft of the regulator is automatically controlled with the help of a voltage relay which can start, stop or reverse the motor as per change in line voltage. The series coil provided with the voltage relay is adjusted in such a way that it compensates for drop in voltage which maintains constant voltage at the centre of distribution of load. A single-phase induction regulator has a (primary) excitation winding, connected to the supply voltage, wound on a magnetic core which can be rotated.